I thought I'd put up a picture of my Nutella macarons. I simply made chocolate macarons and filled them with a Nutella ganache. 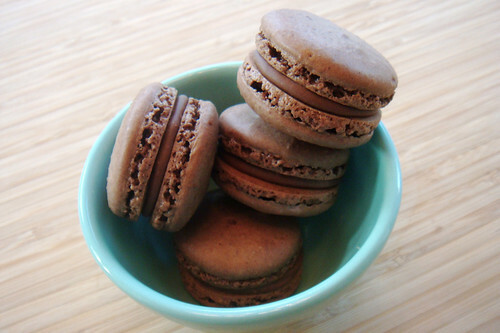 If you're too lazy to make a ganache, just sandwiching the macarons together with pure Nutella would be delicious too! Grind together the powdered sugar with the almond powder and cocoa so there are no lumps; use a blender or food processor since almond meal that you buy isn't quite fine enough. Carefully fold the dry ingredients, in two batches, into the beaten egg whites with a flexible rubber spatula. When the mixture is just smooth and there are no streaks of egg white, stop folding and scrape the batter into the pastry bag (standing the bag in a tall glass helps if you're alone). Rap the baking sheet a few times firmly on the counter top to flatten themacarons, then bake them for 15-18 minutes. Let cool completely then remove from baking sheet. To make the filling, I made a dark chocolate ganache with heavy cream and then mixed in a generous amount of Nutella. These macarons are like little bites of Nutella chocolate heaven! Ah, looks like a delightful treat. Makes me want to have some. I can't believe after years of love of Nutella, and a recently developed love of macarons, I never thought of combining the two! They look and sound scrumptious - gorgeous photos! @dave they do require some effort...but i so enjoy the process! hi! I've read your recipe for the Black sesame macarons and that recipe seems very much more detailed/"delicate" to make compared to this one. Did you take the extra steps such as aging the egg whites, letting it rest before putting it into the oven, getting the perfect consistency etc with these nutella macarons too? I've been having troubles with my macarons so any help would be very much appreciated! :D tia! @Jamie: Oh i definitely would still take all the steps like aging and letting them rest before baking. I just wanted to put a little something up in honor of World Nutella Day before it ended! 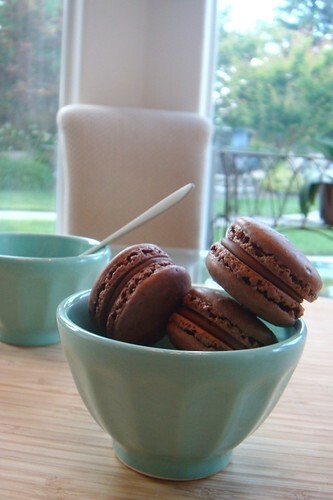 haha :) if you are trying to make macarons I would suggest you follow what I wrote in my Black Sesame post. I agree I spent a LOT more time on that one! p.s. what exactly is not going so well with your macarons? @Stella: Thanks! :) These pictures were before the days of my Canon G10 too! Theyre taken with a little point and shoot! This is beautiful, absolutely beautiful! wow! they are store-worthy! i've always found making macarons very daunting, but your post is inspiring! and nutella day? that's awesome! just straight out of the jar is my way of eating this stuff, he he. Nonetheless, will suggest this recipe to my Baking chef and ask her if we could make it! From the looks of your picture, my guess would be that the flatness of the cookie was due to overmixing the batter by a little bit. Also, judging by the color of the cookie and the hollow center, I would suggest baking the macaron for a shorter length of time. Temperatures also vary from oven to oven so perhaps you could try doubling your baking sheets or lowering the temperature a little to avoid those overzealous feet! Good luck with your next try! It took me many tries to get it right. You're getting close! those are beautiful macarons! I love macarons and Nutella. It sounds like the perfect combination :-) Why haven't I thought of it before? Thanks for the inspiration! Hi it is really a great post. I am amazed how you explain tough things so easily.